The first saw the hotel group teamed up with more than 100 hotels under its portfolio to collect and distribute over 500-metre of prayer mats to several areas across the country, such as Java, Sumatra, Kalimantan, Sulawesi, Papua and some other areas. Archipelago International,a leadingIndonesia-based hospitality management company has opened its hotel in Banyuwangi, a region in the eastern tip of Java. 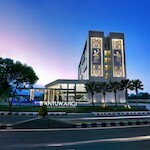 Approximately 25 minutes from Indonesia's first green concept airport, Banyuwangi Airport, designed by celebrity architect Andra Matin, Aston Banyuwangi Hotel & Conference Center will pioneer hospitality in a destination famous for its rich natural landscape and fast becoming a must-visit destination for both domestic and international tourists.